Our team is equipped with the latest professional equipment to clean, sanitise and dry all types of mattresses. 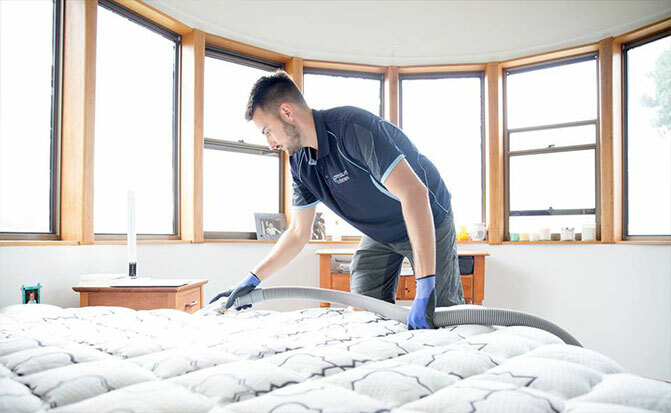 A powerful cleaning system is used by our team for home and commercial mattress cleaning to clean, sanitise and leave the material of the mattress as dry as possible. Our fully qualified and trained mattress cleaners can provide advice on the most appropriate treatment for various types of stains and spillage. High quality bacteria killing detergents are sprayed on the mattress to help clean any dirt and eliminate dust mites to make it clean again. We’ll take care of your mattress and we’ll only use the safest and most appropriate detergent during the cleaning process. We also offer a dust mite and anti allergen protection service. For advice on mattress cleaning or for a free quote, please give us a call. We service the Northern Beaches, Upper and Lower North Shore, Eastern suburbs and the Inner West. Our team is professionally trained in our mattress cleaning process. The head technician working on each mattress cleaning job has completed vocational training at ITI.